Shape has developed a series of strong programmes and supported hundreds of artists under the direction of Tony Heaton OBE. 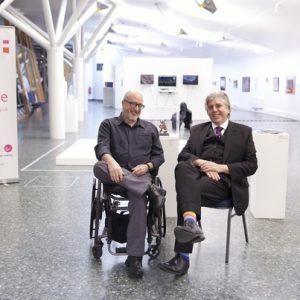 As Tony steps down from his position as CEO he talks to Disability Arts Online about that long list of achievements, his views on the arts, the political landscape and his own plans for the future. Trish Wheatley: Why is now the right time to move on? Tony Heaton: I planned to stay at Shape for at least five years, but no more than ten and I will have been Chief Executive here for nine years by the time I leave at the end of this financial year, March 2017. I always knew that this last year was going to be a very busy, but potentially successful, year for Shape so I really wanted to see that through. We had the Unlimited festivals at Southbank and Tramway Glasgow; the successful tender to Arts Council England to keep delivering Unlimited for another four years with our partners Artsadmin, working closely with Manick Govinda and Jo Verrent, the continued partnerships with British Council for Unlimited International and Spirit of 2012 for emerging disabled artists through Unlimited Impact; the National Disability Arts Collection and Archive (NDACA) launch at the House of Lords and a growing relationship with Buckinghamshire New University for the NDACA wing. My last objective will be to submit the NPO application to the Arts Council and write with the team here our business plan for the next four years, and once I’ve set all that in place it will be time to move on. TW: What are your plans for the future? TH: Shape knew that our fantastic chair Pauline Tambling CBE was having to step down after the maximum nine years. She has been an amazing resource and mentor for me, and a tremendously successful, experienced and decisive leader for the Shape board. It seemed logical in many ways for me to transition into chair. 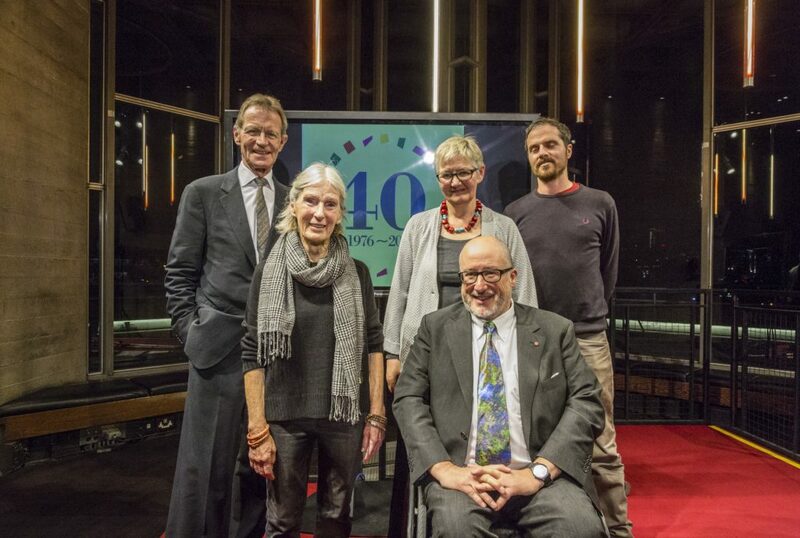 I said at the friends of Shape 40th event, Shape is a bit like the mafia – you can never escape, so I’m going to take over the role of chair and Pauline is going to drive forward the Friends of Shape scheme. In many ways everything changes and everything stays the same. I want to have some time to develop my own sculptural practice. I’d like to do more writing, particularly around the history of disability arts. I also plan to do some consultancy and advisory work in the sector so I’m not exactly thinking of disappearing entirely. It’s not pipe and slippers time by any stretch of the imagination! That’s the plan. 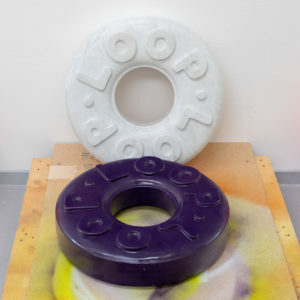 More sculpture – more useless objects in a world that’s already overloaded with useless objects! TW: Do you know what you’re going to work on first? 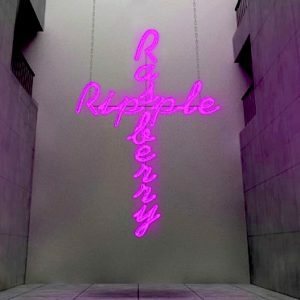 TH: I’m itching to make the neon piece ‘Raspberry Ripple’ which is on my website as a CAD design. I’ve got two bits of stone that I’m working on, a piece of Portland stone and piece of Carrara marble that are both reasonably big pieces and I’m in the process of making some etchings and woodcuts. I’ve got some ideas for paintings. I never have any time for painting and I’m terrified of colour so I’m going to face my fears and see whether I can get some of the paintings out of my head. TW: What are you most proud of from your achievements at Shape? TH: I’m a bit wary of pride, but I think we’ve positioned Shape into a good place in the cultural landscape over the last 10 years. I think we’ve developed a clear identity, people know what we do. I also wanted us to be seen as an authentic and knowledge-based organisation, I think we’ve achieved much of that. The Adam Reynolds Memorial Bursary (ARMB) is very close to my heart, partly because Adam and I were friends, I’d known him for a long time, I miss him and it feels that the bursary is a great way to perpetuate what Adam gave to the Disability Arts movement. He was all the great things about being a disabled artist. He saw his perceived weakness as his greatest strength, which was his muscular dystrophy. He made some great work, I love the subtlety of the nature of disability arts from an Adam Reynolds perspective, which is that his work often occupied the places that other people didn’t look. It’ll be the tenth year next year, we’re at Turner Contemporary next, fantastic gallery. I think it’s going to be amazing. We’ve worked with a great list of places for an artist to work on a bursary. 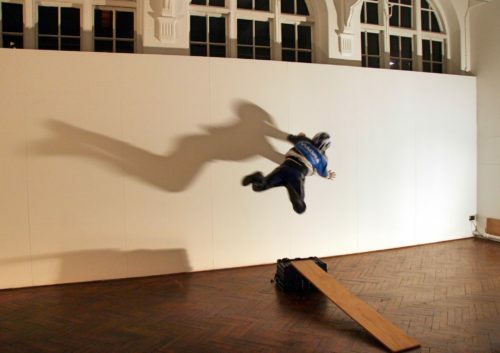 I think the Shape Open goes from strength to strength, people can really identify with it and having Yinka Shonibare MBE as patron is amazing. Unlimited and NDACA have been fantastic, so yes, lots of things that if I believed in the word pride I could be proud of. When I talk about authenticity, it’s that buy-in from the British Council, the Arts Council, Spirit of 2012, Creative Scotland, Arts Council of Wales; they’ve bought into our work because it’s good, ambitious and authentic, having people like Nick Serota and Darren Henley publicly acknowledge our importance to the arts, these are the things I’m pleased to have been able to envision and deliver on. TW: How has the landscape changed? TH: It’s got a lot tougher. The change of government, what I think is the fake austerity agenda, Arts Council cuts, cuts to local councils, cuts to London councils, the closure of regional museums and galleries, all that support for the arts has started to dry up and disappear. The devaluing of the arts within education. Totally at odds with the increase in visitors to museums and galleries. It’s clear that the Tory government have finally realised that the Iain Duncan Smith culling of disabled people has not been cost effective and it’s been a propaganda and human disaster. I think Theresa May has seen this is not winning any friends and it is not doing what it’s supposed to do, which is saving money. They’re spending more money, but they’re not spending it on disabled people, they’re spending it on the likes of ATOS, the deeply flawed administration and assessments process. People who have got the energy to fight are fighting and huge amounts of them are winning their appeals, so it’s just a ridiculous situation. It’s massively oppressive, and if you want to get disabled people into work this is not the way to do it. There may be a slight change of rhetoric but I don’t hold out any great optimism for it. TW: What about artistically, how has it changed? TH: When I talked at the Awkward Bastards conference [March 2016] I said “artists are a bit like weeds, the harder you cut them down, the stronger they grow”. So, I think in one sense coming to Shape at a time just as austerity kicked in, just as the money ran out, we had to be much more resilient about things that we did. One of the things that I’ve tried to do is simplify Shape so it’s very clear what we do: we’re a knowledge-based organisation, we deliver on strategic projects which are high in impact and relatively low in cost. TW: What are the biggest challenges for disabled artists working today? TH: It’s tough for artists to get support when the austerity agenda rages, but I think it’s the things that have always been challenging for artists and disabled people. The lack of access to goods and services, those perceptions that are constantly manipulated by the right-wing press labelling disabled people as benefit scroungers or superheroes. We’ve been seen as phenomena rather than as human beings, ordinary people trying to get on and do things. I think the subsuming of the Disability Discrimination Act into the Equalities Act sets up a smoke screen for people who aren’t embedded into the nuances of disability arts and politics like we are. You talk to people out there and they think access is sorted out and that disabled people don’t face discrimination and it’s not true. I think the hard realities for disabled people are still there. There should be a more accessible world by now but it’s still very difficult for people to get out and do ordinary things on a day to day basis. TW: You’re about to go through some recruitment at Shape, what are you looking for in the new Chief Executive? TH: Well, a handsome, cheeky, chirpy northerner obviously! 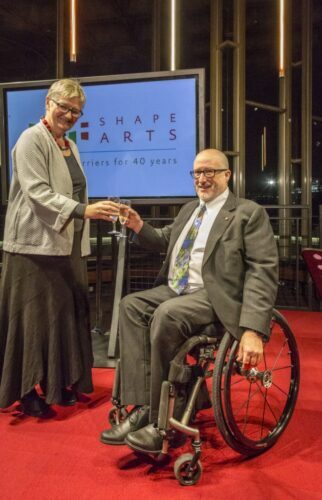 No, seriously, Shape is looking ideally for a disabled person with good leadership skills, who understands the arts sector, who has got the energy and commitment for the things that Shape’s been doing for the last 40 years. 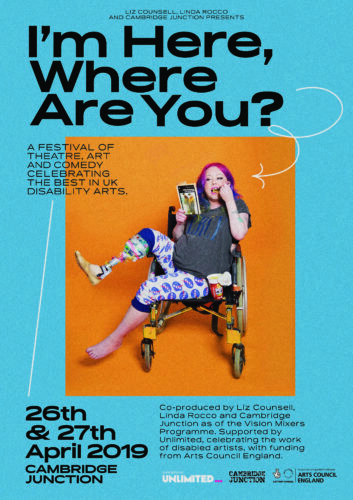 Somebody ambitious, with vision to move us into the next 40 years and maintain Shape as one of the leading disability-led arts organisations in the country with an international presence. For full details about the Chief Executive vacancy at Shape, please see the job advert here. nine years has gone so fast…thank you Tony for your drive and commitment and glad you are not going too far!!! Wow. What a shock, but to good to learn Tony will still be active in the sector, both as an artist and instigator.